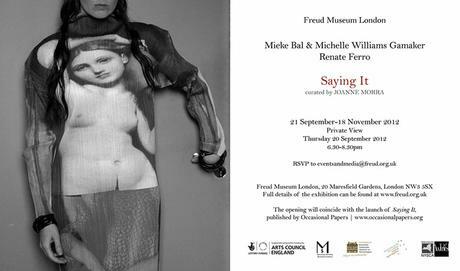 With pleasure and pride, Michelle Williams Gamaker and I announce the exhibition Saying It that opens at the Freud Museum in London on Thursday September 20th at 6.30 pm. 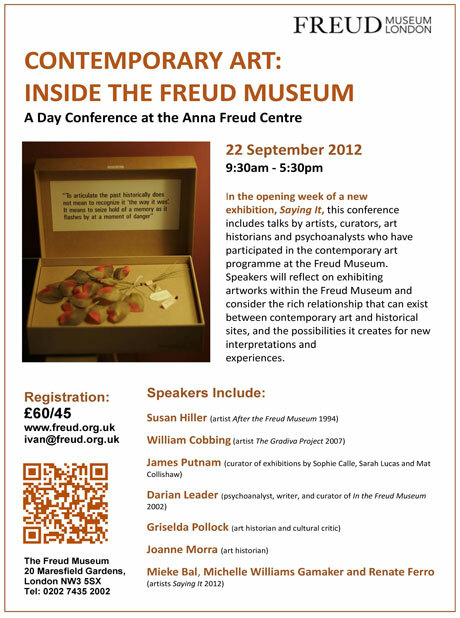 This is a collaboration with American artist Renate Ferro who presents installations on some of Freud’s key concepts. Our works are all concentrating on Sissi, the allegedly “schizophrenic” patient. Short, looped videos are dispersed throughout the museum, among Freud’s furniture, like footnotes from the present reality of psychosis addressed to the inventor of the talking cure. The videos show such a treatment in the act. If you are going to be in London the 20th, please join us. You can meet the actresses of the videos, Marja Skaffari, who plays Sissi, Marjo Vuorela, Sissi’s analyst, and Anniki Järvinen who plays Sissi’s mother, as well as the author of the book that underlies our project, Françoise Davoine, and several authors of catalogue essays. And of course, we will be there, as will curator Joanne Morra. On Saturday, September 22, the Freud museum holds a conference around the contemporary art exhibitions they have been hosting over the years. Michelle and I will participate with a dual talk showing slides of the Mère Folle Project, and discussing the idea of intervening in a theoretical and domestic space.